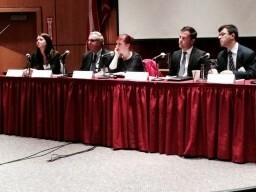 College of Law Assistant Professor Tara Helfman, center, presents at the American Branch of the International Law Association’s annual meeting in New York City. College of Law Assistant Professor Tara Helfman presented Oct. 26 at the American Branch of the International Law Association’s annual meeting in New York City. Her presentation focused on the legal and strategic implications of the dispute over maritime and territorial sovereignty in the South China Sea. China claims sovereignty over approximately 80 percent of the sea, which is encircled by Brunei, the Philippines, Taiwan and Vietnam. More than half of the world’s commercial tonnage travels through the sea each year, and it is estimated to hold the fourth largest deposit of petrochemicals in the world. It is a major geopolitical flashpoint. The discussion was moderated by Steven Hill, deputy legal advisor to the U.S. Mission to the United Nations, and chaired by Christina Hioureias of Chadbourne & Parke, LLP.